One of the most followed and loved car across the world for decades has been the Mercedes Benz S class. Not only this has been one of the flagship car of the Mercedes Benz clan, but this car has also been considered to be one of the harbinger of new tech. 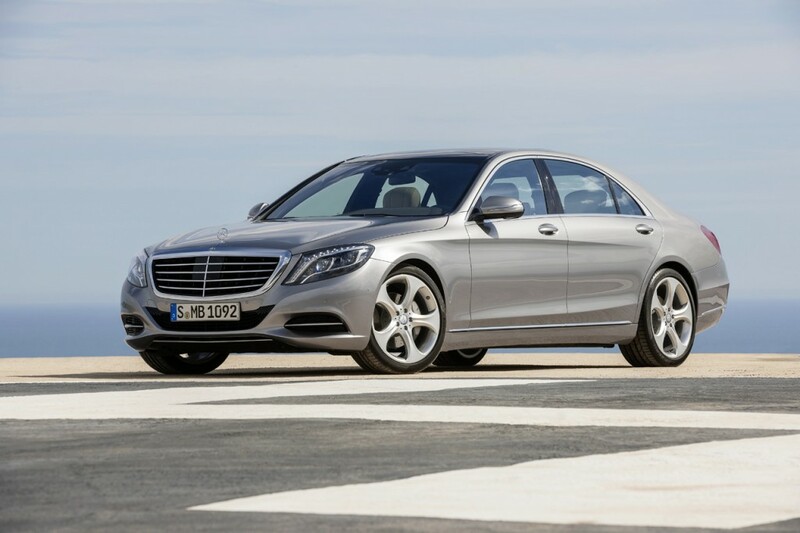 No doubt that keeping in line with the expectations and reputation, the new 2014 Mercedes Benz S class has a number of new technological marvels and other upgrades for the car. 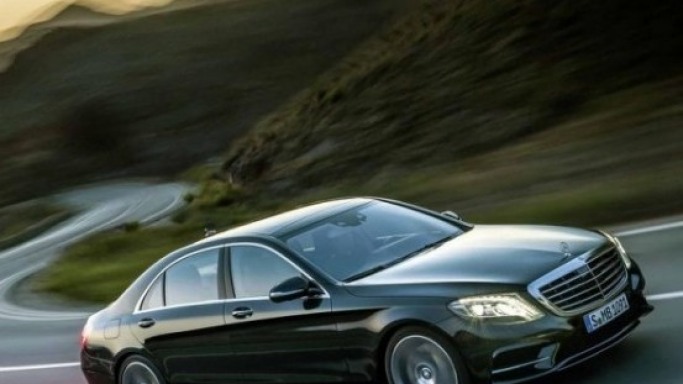 There are a lot of speculations that the new 2014 Mercedes Benz S class is all set to replace the famed Mercedes Maybach. The car: The New 2014 Mercedes Benz S class has the bold and powerful look of Mercedes, though the styling has changed slightly both in the interiors and exteriors, yet the car retains the look of a distinctive and signature Mercedes S class. The line works are nice and elegant, and does not shock the eyes with any surprises. The taller hood is accentuated with a 3D grille that is slightly larger than the previous editions. This adds to the powerful and muscular look of the new 2014 Mercedes Benz S class. the roof is nicely sloped down to the rear in a gradual descent and gives the car an elegant and spacious and longer look. The Benz’s signature dropping lines along the sides accentuate the look. The back is also tastefully done and exhibits some signature Mercedes S class styling. The exhausts and air vents have been artfully ensemble in the overall design to give the car a classic and elegant look. 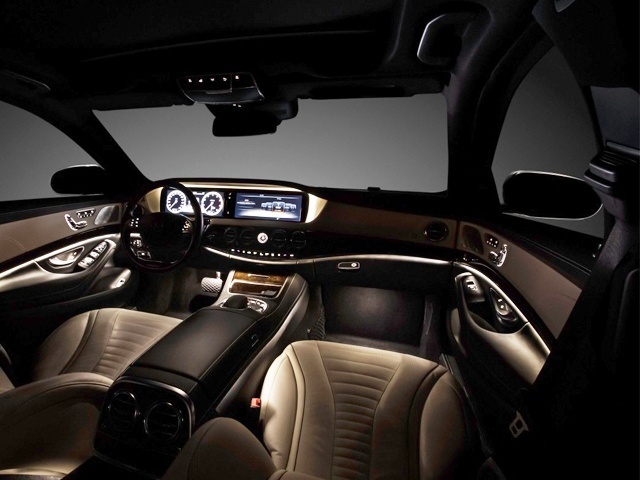 The Interiors: The flagship sedan from the stables of Mercedes Benz has been loaded with amenities and innovations. The seats have “hot stone principle” following heated air cushions to massage your back. Active seat ventilation increases the heat using oscillating fans. The interior is an excellent display of wood, leather and glass. Switches are metallised and solid aluminium controls. Pearl paint finish and complete LED display are some of the new additions. 12.3 inch TFT display with high resolution acts as a gauge cluster for the driver, and Satnav and other info display center. Burmeister 3D surround sound systems having a Frontbass resonator from SL Roadster is installed for sound in the new 2014 Mercedes Benz S class. The Linguatronic Voice command system is equipped with reading ability for text messages and e-mails. Among other luxury and pampering features are individual heating and cooling, as well as heated and cooled cup holders, and also heated door panels and armrests. The seats are reclining and can be done to a huge degree. One thing the drivers surely will enjoy is the two spoke wood steering encased in plush leather. The interiors are highly insulated to give an isolated and noise free ride. 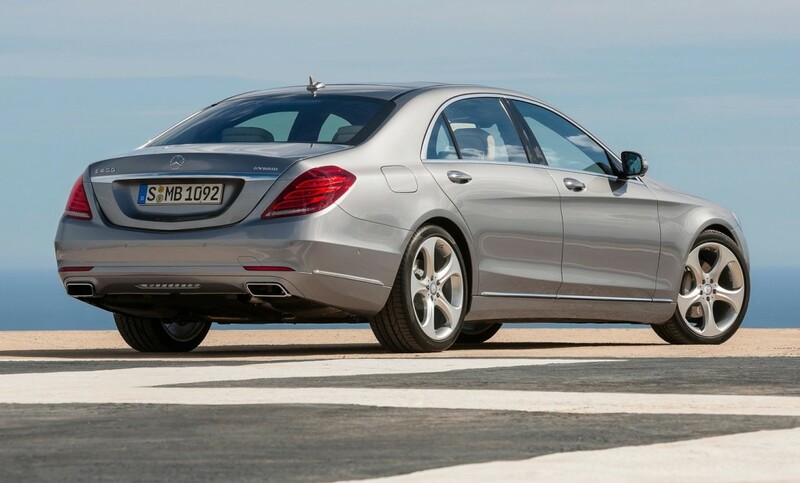 The Engine: The new 2014 Mercedes Benz S class will be powered by twin-turbocharged V8 engines. These engines have been reworked to generate a mighty 455 HP. The torque will be an impressive 516 feet pound. The car is to accelerate from 0 to 60MPH in 4.8 seconds flat. The fuel efficiency is expected to be good. An eight speed automatic transmission is mated with the engine and the new 2014 Mercedes Benz S class is available in rear wheel or 4Matic all wheel drive. The Other Features & Safety: The car is designed on a aluminium Steel hybrid chassis making it lighter and stronger too. The new 2014 Mercedes Benz S class is possibly the first car to be illuminated by LED lights completely. The headlights have 56 LEDs each, and the interiors are also illuminated with LEDs. Headlights and taillights adjust their brightness automatically in different situations for the ease and comfort of the driver and warn the other drivers. The car has been loaded with sensors that monitor the vehicle’s surroundings all around. The Pre-safe collision avoidance has been upgraded and automatic braking has been introduced. The brakes have been improved and can prevent whiplash by holding on. Even the front windshield wiper has been improved and updated. The introduction of active seatbelts has been another safety feature that pulls drivers and passengers away from the direction of impact. All other standard safety features are there. Finally: In line with the reputation the New 2014 Mercedes Benz S class, has redefined luxury and elegance. It has also redefined safety standards and features you can expect. It is truly world class and an epitome of luxury and technology at their combined best.